Don’t sell “Tableware” … sell the dining experience … which in a civilized environment includes food, wine, decor, fixtures, and fittings. 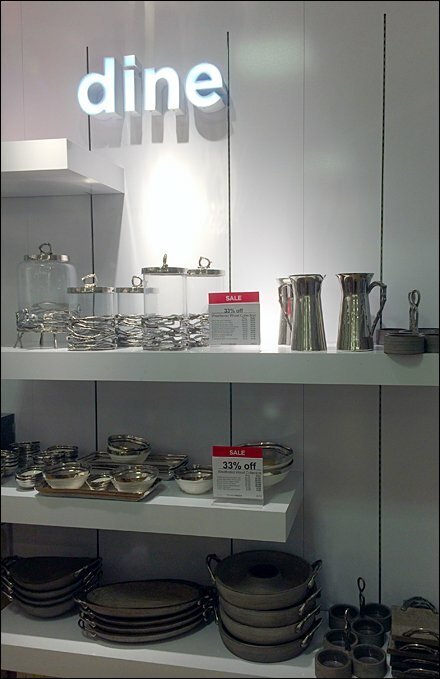 A department title of “Tableware” might be great in mass merchandising. But for the good life, “Dine” is a more upscale sizzle to the sell. CLICK the thumbnail for an alternate view. A lit sign with moody departmental lighting also sets a more posh feel. Then compare with other JCPenny outfitting below.